It’s been awhile since I posted, and while I do have a huge backlog of subjects, today’s is a really recent jaunt Sam and I took over to Sault Ste. Marie. Also known as “the Sault” (or, even just the Soo) to Michiganders, Sault Ste. Marie is a neat old town that feels far from its age (which happens to be hmmm, more than 300, since it was founded in the 1660s. Maybe 350-something years old.) The stunning stretch of history of the town is always there, just behind and beneath the new developments and updates. We go there once in a while for business, and always look forward to finding new, cool things — because that’s what happens every time we go! 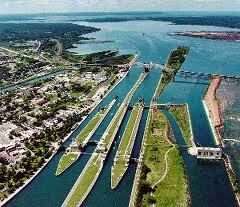 The Soo Locks as seen from the air. The shoreline view is pretty good, too. It’s a maritime town, centered on the St. Marys River and the Soo Locks that allow Great Lakes freighters to pass between lakes Superior and Huron. (You shouldn’t need three guesses to decipher how the town got it’s name.) It has a Canadian sister city on the other side of the river; Sault Ste. Marie, Ontario, which is much bigger. The locks are a big draw, and there’s no doubt it’s pretty cool to watch the giant ore carriers pass through. There’s a phone number to call for a shipping schedule to maximize your chances of catching the show here. Or, if you have some time to kill, there’s Karl’s Cuisine restaurant overlooking the locks. Although it’s nestled next to a mini golf course and sports tourist-friendly decor, make no mistake; the chef is talented and committed to using local ingredients and foods, and it’s well worth stopping. In the past, we’ve also enjoyed eating at Antlers, which also is by the river and has come under new ownership in recent years. The wild game lasagna is always a favorite. But this time, it had to be Clyde’s Drive-In, which, like all great drive-ins, opened in the 1940s. Unlike many, it’s stuck around thanks to a loyal following, and burgers and fries raised to perfection. They hand-make the burger patties, use plenty of malt in their malts, and you won’t ever get a soggy or underdone fry or onion ring at Clyde’s. The small burger shack overlooks the ferry to Sugar Island, a little hamlet on the islands in the middle of the St. Mary’s River, and isn’t the easiest to find, but worth the effort. 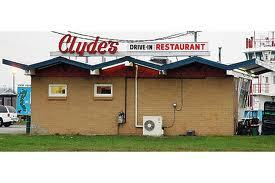 Clyde's Drive-In. And yes, there is curbside service if you want it! Speaking of Sugar Island, we also found an awesome new store on this visit to the Sault. It’s called Island Books and Crafts, just opened in the winter, and it’s named that because owner Les Townsend is a Sugar Islander born and bred. He’s also a fun guy to talk to, and knows quite a bit about the store’s home, a huge building on the corner of East Portage Avenue and Ashmun Street that was formerly the Sault Savings Bank. Some of the original bank marble still graces the entry. You’ll find plenty of books there, alongside the work of dozens of area crafters and artists, from handmade jewelry to pine-needle-and-agate woven baskets to gorgeous hand carved wood furniture. I look forward to going back to the Sault and finding new things each time — It’s at the least a great day trip for U.P. residents (or for northern L.P. residents), but there’s more to do and see than you can ever do in a day, which is what makes it so much fun to keep coming back. Where are your favorite stores and restaurants in Sault Ste. Marie? What do you look forward to doing or visiting there?